I decided to include the Headless Horsemen simply because The Legend of Sleepy Hollow is one of my favorite legends, favorite Tim Burton films and, of course, is one of my favorite Disney cartoons. The ghost of the Headless Horseman terrorizes the town of Sleepy Hollow for no good reason, making him a prime example of the sin wrath. The Horseman is a big fan of terror, murder and assault. 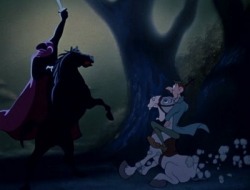 Okay, all you conspiracy theorists out there, try this one on for size: is Brom Bones the Headless Horseman? Think about it: he had the motive (with that spineless Ichabod Crane out of the way, nothing would stand between him and the buxom Katrina von Tassel) and the opportunity; why else fill the timid schoolmaster's head with ghostly tales on that dark and stormy autumn night? Humiliated by that blasted boy, Peter Pan, time and again, Hook writhes with unbridled fury at the mere mention of his name. And for good reason; it was Pan who lopped off one of Hook's hands and fed it to that accursed Crocodile, who enjoyed that little appetizer so much he keeps prowling the area for a second helping. The elegant captain wants nothing more then than to exact revenge on that Pixie Dusted punk once and for all. As I only put the Headless Horseman in for my own entertainment (though he does personify "vengeance upon one who has not deserved it, or to a greater extent than it has been deserved, or in conflict with the dispositions of law, or from an improper motive," there is not much written on this Disney film, therefore I will focus mainly on Captain Hook and Shere Khan; two sociopaths at their finest. In early development of Peter Pan, the story department wrote their analysis of Hook's character: "He is a fop...Yet very mean, to the point of being murderous. This combination of traits should cause plenty of amusement whenever he talks or acts" (Thomas, Frank & Johnston, Ollie: "Chapter 4: Nine Old Men," section: "Peter Pan", pages 109-113. The Disney Villain, 1993). He is frequently filled with murderous rage (or wrath) through out the entire story and wishes nothing more than to destroy Peter Pan. 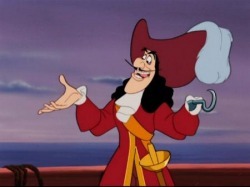 Captain Hook is introduced in the animated film as a sinister, frustrated man, plotting to trap Peter in his lair, but also a bit of a buffoon, hiding from the crocodile nicknamed 'Tick Tock' who took off his hand. He seeks revenge on Peter Pan for having fed the crocodile his hand amidst battle, and will keep his ship and its crew anchored in Never Land's waters until he finds the boy. Hook is a dangerous villain, without conscience, yet is dependent on his sidekick, Mr Smee. When Peter defeats Hook, he begs for mercy and promises to leave Neverland forever. However, Hook tries to attack Peter again, only to be foiled. At the conclusion of the film, Hook is being chased by the crocodile off into the distance. Walt Disney insisted on keeping Hook alive, as he said: "The audience will get to liking Hook, and they won't want to see him killed" (ibid). Though Hook is a sociopath filled with rage, the definition of wrath, he is a likable villain because he is such a buffoon. Shere Khan, on the other hand, is a different story. In Disney's 1967 animated adaptation of The Jungle Book, Shere Khan is the main antagonist, entering the story about two-thirds of the way through. Khan is not depicted as being lame, like Hook, — quite the contrary, he is powerful, deadly, and sophisticated. His mere presence in the jungle compels the wolf pack to send Mowgli away, since Shere Khan will kill him because he is human. According to Akela not even the entire wolf pack could protect Mowgli from him. Man's gun and Man's fire are the only things Shere Khan fears. In the climactic battle of the movie, Shere Khan finds Mowgli. Impressed by the boy standing up to him, Shere Khan, for his own amusement, gives him a ten second head-start to run-away. Once he reaches ten, Baloo grabs his tail and holds him back. Shere Khan chases Mowgli, who is being carried away by the vultures, while dragging Baloo behind him. Baloo proves such an impediment to Khan that he decides to fight Baloo, nearly killing him, until the vultures arrive and distract him. Mowgli finds a burning branch from a lightning-struck tree and ties it to Khan's tail. When a vulture's comment prompts Khan to notice the branch, he attempts to put the fire out and then flees when he fails. It is unusual, though I cannot find any articles on it, that the worst Disney villainess, that kill and assault and act out wrath simply for the fun of it, all end up running off instead of being killed. I would think that wrath would be one of the worst sins and therefore most punishable. Just some food for thought.